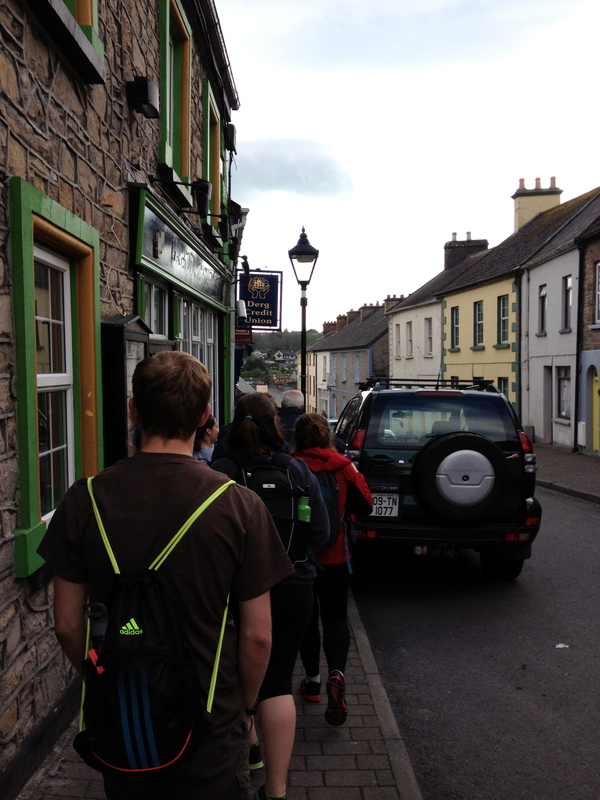 My second day in Ireland (because I was practically dead my first day): a travel log – Protagonized. 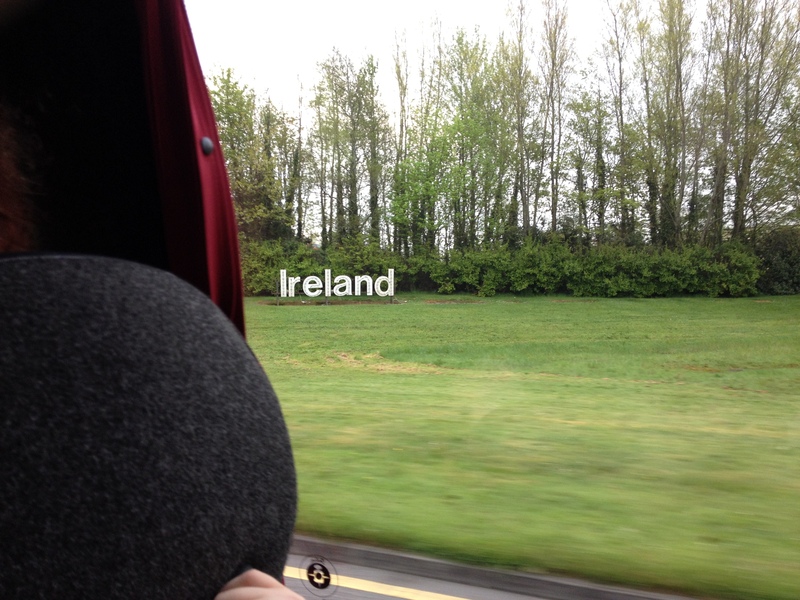 The first picture I took in Ireland, on our way out of the airport. Not great, but I like it. My second day in Ireland. I was not conscious enough to write anything the day before. The day before was a whirl of nauseating hunger, sleep deprivation like I’ve never felt before (72 hours) and nonstop inconvenience. I wasn’t in a good mood. Ah…narrow streets and colorful houses. My favorite. Also, my classmates. Ireland is a fascinating place. It’s the brightest green I’ve ever seen and everything is little and old. There are so many different languages being spoken all the time. Lots of people from England, Australia, France, and Russia. Things are done just differently enough to be confusing, but I feel like I’m getting the hang of things. Things like money and understanding thick Irish accents. Every moment I’m learning how to do something new. It feels good. Also, the oddness of it all feels like something I could get used to, which is comforting. 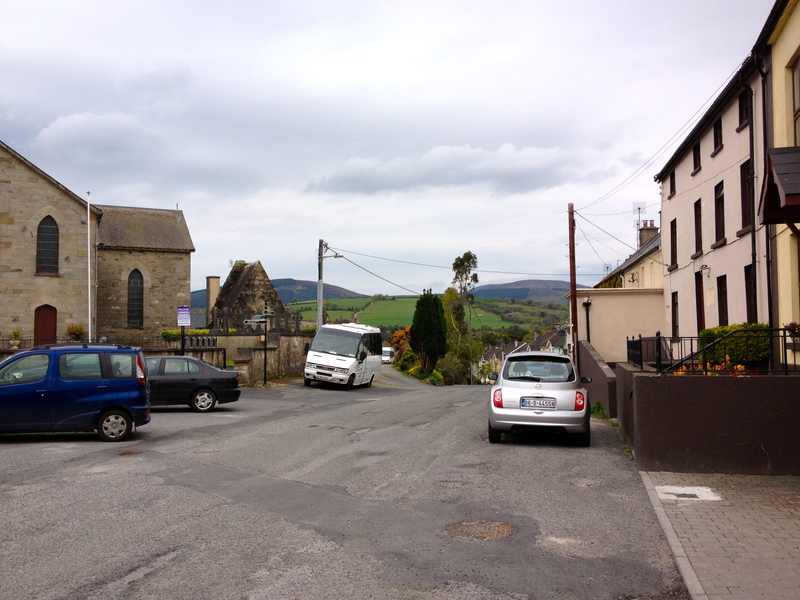 The first town we visited in Ireland. Part of Derg, I believe. Nice people fed us sleep-deprived, starving foreigners a big, traditional Irish breakfast. The first place we went was Lough Derg. It is a huge lake, all misty and stuff like the movies. I saw a huge swan and then we took a group picture. I’m told the lough has healing powers. My professor stuck her toes in the water, just in case. 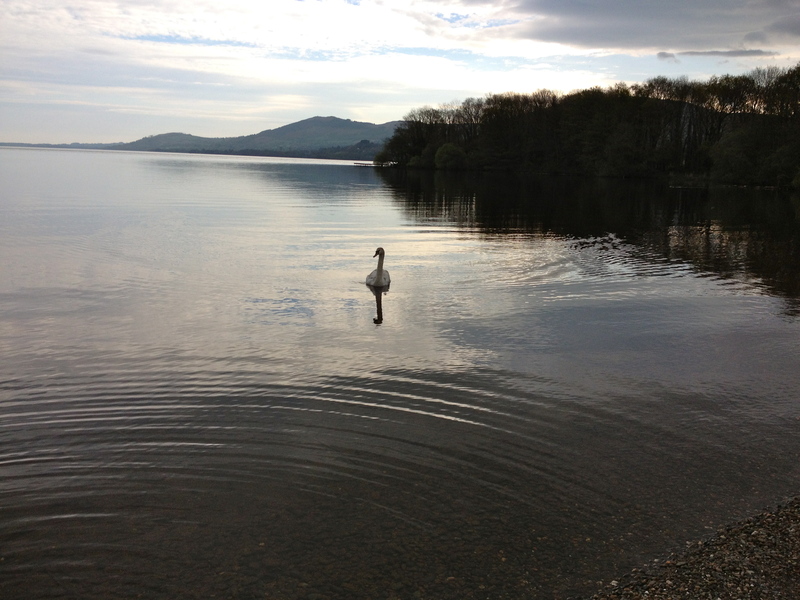 Magic swan in the magical Lough Derg. 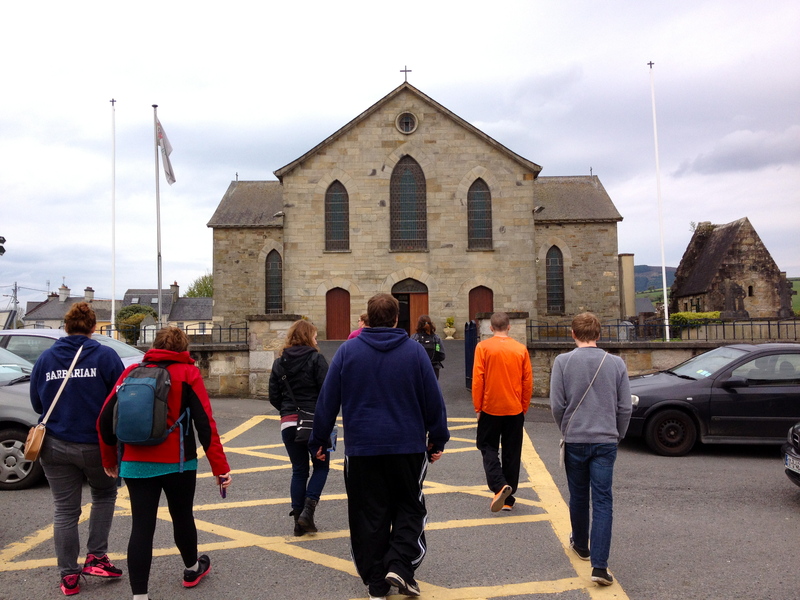 After Lough Derg, we were invited to a nearby town (Derg, I think) for a traditional Irish breakfast, complete with large slices of ham, bread, eggs, and black pudding (blood sausage). I didn’t know at the time what black pudding was. In America, blood-anything is bad news. The closest we come to blood being an okay food is undercooked burgers. That being said, the black pudding was pretty good, if a little intense. It was very salty and a little crunchy, almost like gelatin mixed with quinoa. I enjoyed it but I couldn’t eat very much of it. The church in the first town we visited. To the right is the priest’s room, a 1000-year-old stone building. It amazes me how old some things are in Ireland. Derg has a small church, with a small brick priest’s room adjacent, and that room is 1000 years old. I can’t imagine anything being 1000 years old. 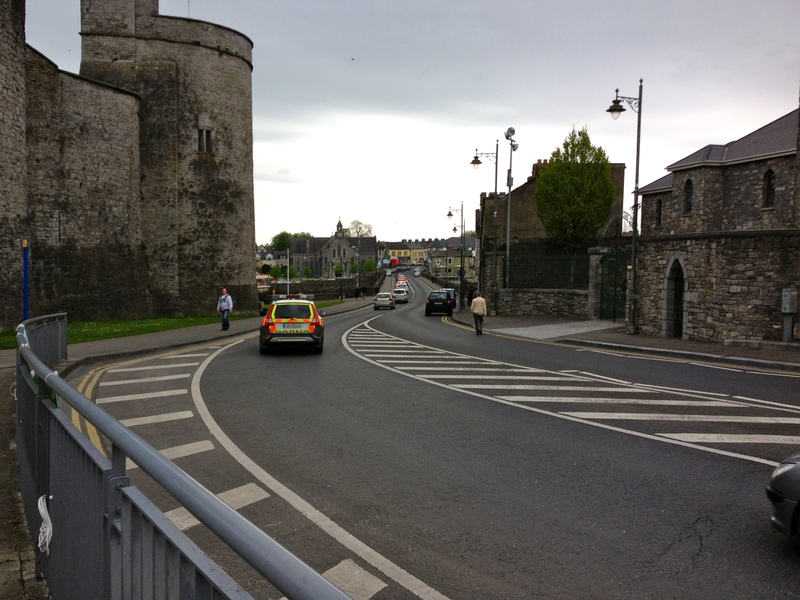 King John’s Castle in Limerick, built on the River Shannon. Also, I’m endlessly fascinated by foreign streets. 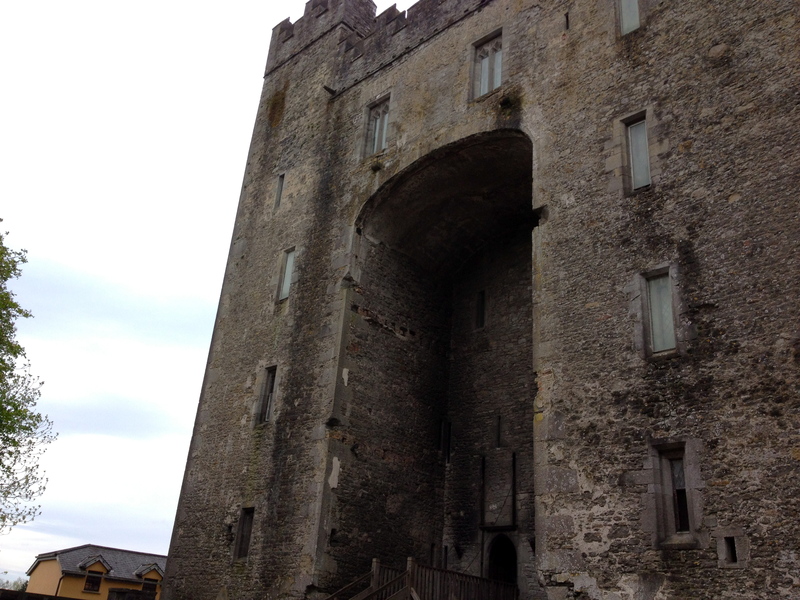 We went to one of the many many castles in Ireland: Castle Bunratty. It was the first castle I had ever been too. The builders of it truly thought of everything. They made the doors small enough that only one person could come through at a time (that way the residents couldn’t be rushed by enemy soldiers), and they made the staircases narrow and twisting at just the right angle so that an enemy soldier coming up the staircase wouldn’t have room to swing his sword, but a person at the top of the stairs would have plenty of room for theirs. Next stop, the Cliffs of Moher. 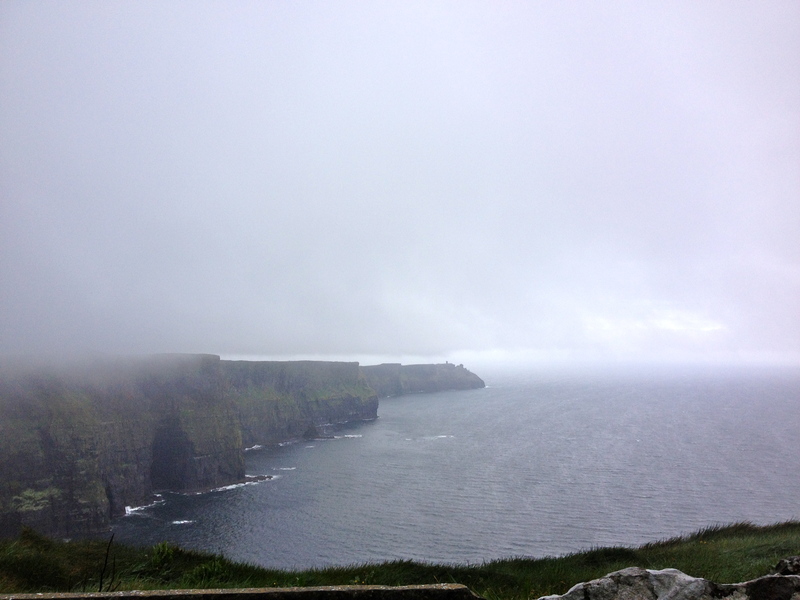 When we arrived, there was too much fog to see the cliffs, but it finally cleared. What an amazing sight. The Cliffs of Moher. Pictures can’t capture how tall and expansive these cliffs are. 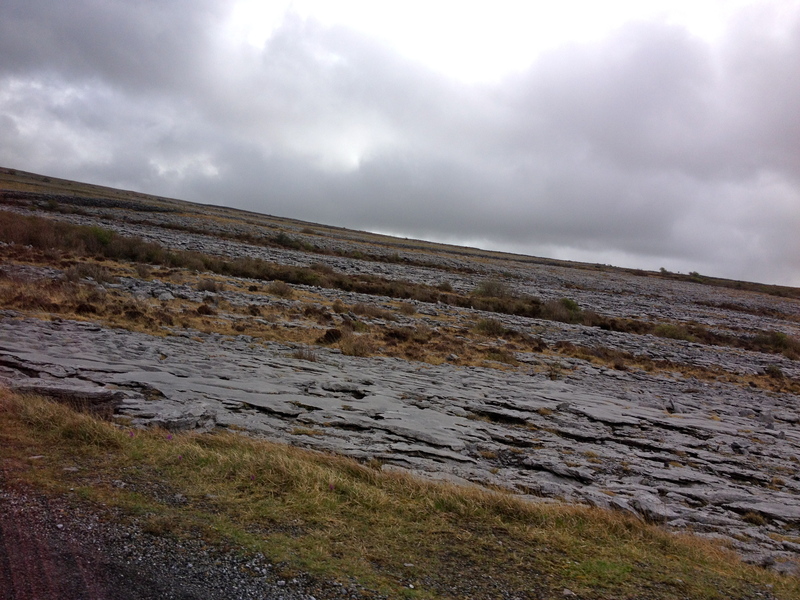 The Burren was the most intriguing place we had visited so far. It is 160 square kilometers of solid rock. I’m told that a long time ago, Irish people didn’t live on the Burren, but they wanted to, so they had to create their own soil by carting seaweed from the beach, laying it all over the ground and letting it decompose. Nowadays, there is enough soil for farming and livestock. The Burren. Flat rock as far as the eye can see. 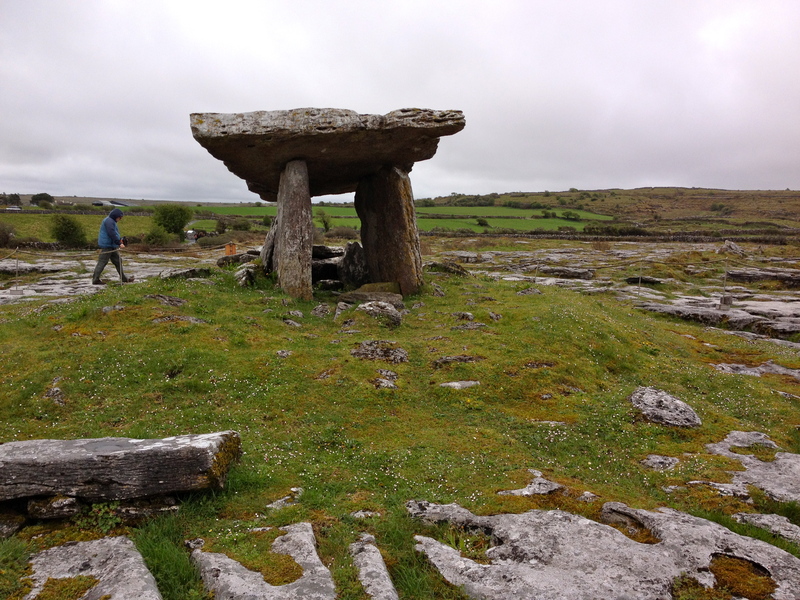 Up on the Burren is a stone tomb that encapsulates the odd ancientness of this country. This tomb is quite literally, just a slab of rock resting on two other slabs of rock. There’s nothing particularly special about it. It’s in the middle of nowhere. But it has been standing since 4600 BCE. Just because nothing has been around to push it over in all that time. 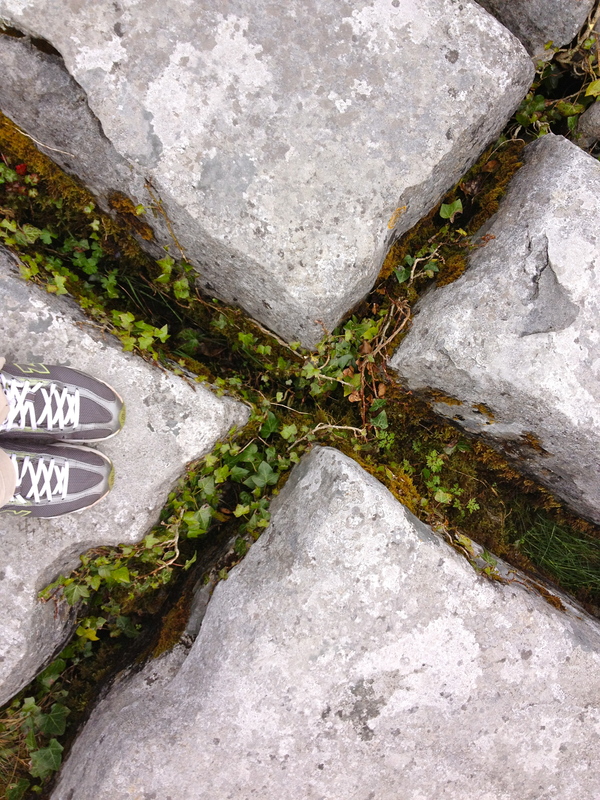 The ground at the Burren is made of these kinds of rocks. That concept blows my mind. In America, things seem to pass away so quickly. The only manmade structures older than a few hundred years are giant buildings or monuments that undergo rigorous upkeep. But in Ireland, just mixed in among the modern world, are pieces from the past that are still around, not because they are some heirloom or patriotic symbol, but just because people decided to leave them alone. I don’t know how that’s possible, but it is. The remains of a tomb built in 4600 BCE. I have no idea how this is still standing. On our way back from the Burren, we stopped at the Aillwee Caves, a system of ancient, natural underground tunnels that spread under the hills near the Burren. When I say ancient, I mean ancient. Spelunkers have found bear bones that are thousands of years old, and there are stalagmites that are 100,000 years old, at least. Again with the impossibly old things. 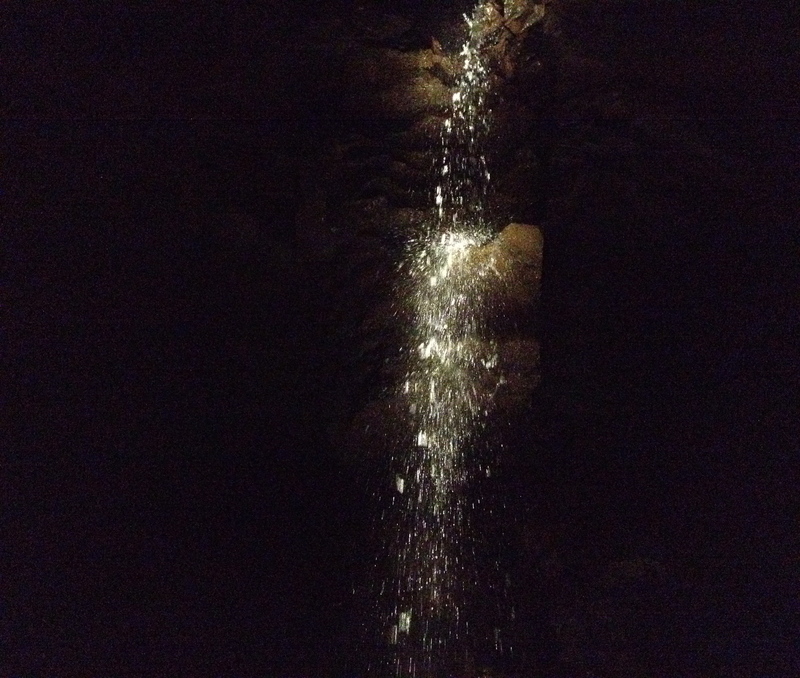 A waterfall inside the Aillwee Caves. I found that taking pictures in a cave is nearly impossible. Things are so acceptable in Ireland. Smoking and drinking are normal, healthy things for people to do. From what I’ve seen, it seems like they’re viewed as scandalous only in the US. 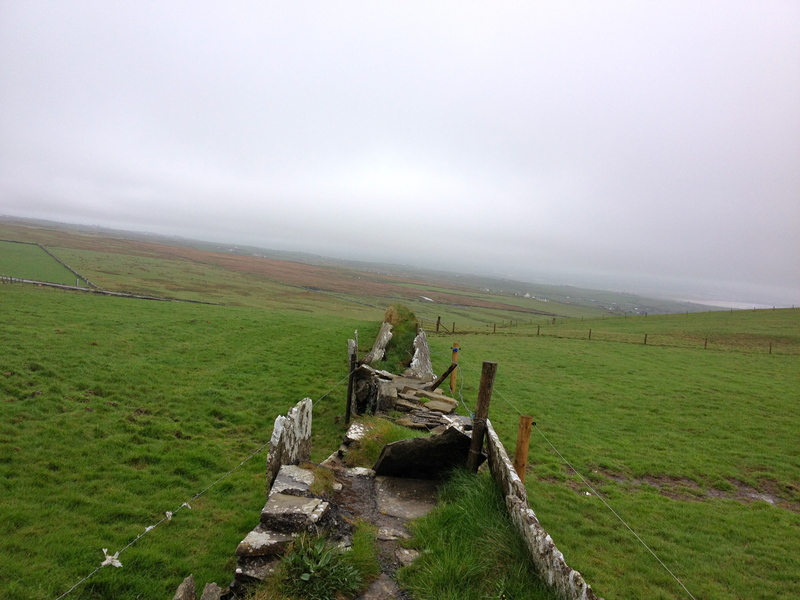 One of Ireland’s famous stone walls under repair in vibrant green fields near the Cliffs of Moher. I’m starting to realize that people from different countries not only speak different languages, look different and use different money, but they also come from different traditions, histories, and experiences. They think in a different way because of how they were raised. We come from very different starting points, just because we have different histories. It’s fascinating to see. Even though we are both (mostly) white and English is our first language, Ireland and the US are completely different. A/N: I went to Ireland in 2013 and didn’t end up posting anything about it (even though I nearly filled my journal) or posting any pictures (even though I took tons of them). So I thought I’d put some of them up here. On a similar note, I’m going to Japan next month! I’ll be there from January 30 to February 28, during which I’ll be training for my TESOL certification. You can get TESOL certification much more easily online, but I’ve always wanted to visit Japan, and a TESOL class seems like the perfect way to spend some time in Japan. Plus, I’ll be a certified English teacher, if I ever choose to teach English abroad. I’ll be posting about my Japanese (mis)adventures under my travel tag.